The cost of new energy technologies is decreasing rapidly. The cost of wind generation is down by 75% in the 9 years 2008-2017, and solar costs are down 55% for rooftop solar and 71% for utility-scale solar. The cost of LED lighting, one of many newer energy efficient technologies that reduce the demand side of the energy equation, is down an astonishing 94% since 2008. 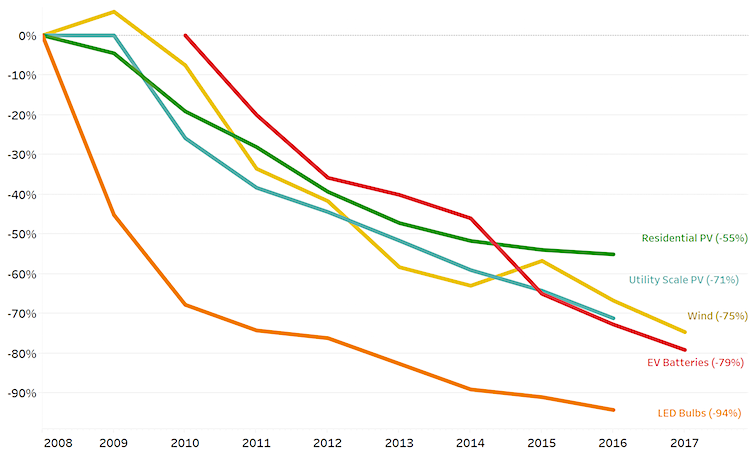 The cost of battery energy storage, which can displace expensive "gas peaker" plants and serve many other functions on the grid, is down by 79% in 7 years. These downward trends will continue, so their value proposition will only improve over time. These technologies are called "disruptive" because they challenge the way our electricity system currently operates, especially the utility business model. Regulated monopoly utilities like Xcel and Black Hills earn a rate of return on their investments in grid infrastructure – power plants, transmission lines, substations, etc. – so their preferred solution to all problems is to build more traditional infrastructure (see "cost-of-service business model"). However, those revenues are threatened when customers buy less energy after they invest in energy-efficient lighting and appliances, insulate their homes, or produce their own electricity on their rooftops or in shared community solar installations. These "Distributed Energy Resources" (DERs) are great for reducing ratepayers' bills, but are threatening to utility profits. Source (Natural Resources Defense Council – Previously published by the U.S. Dept. of Energy). Note: Custom graphs of energy technology cost reductions and capacity increases can be constructed on that webpage using publicly-available data. Forward-looking states are addressing this disruption in different ways (Utility Dive article).